It's getting difficult to keep up. A month ago I bought a CAMP Nano Wire carabiner. Before I can even get off my lazy keister to review it what do I see while strolling through the aisles of REI - hey, I was there to buy a snowsuit for my 2-year old - but this little beauty. 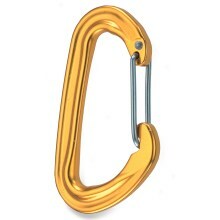 The CAMP Nano 23 sets a new high mark for logical product naming: it weighs 23 grams, or .8oz for the rest of us. This is versus 28 grams or almost a full ounce (fattie!) for the Black Diamond Oz. Other specs are equivalent to the Oz, with a slightly slimmer gate opening of 21mm versus 22m for the Oz.